There’s been an awful lot of hype about this book, leading up to publication. Everybody is using the hashtag #WTFthatending so I knew that there was going to be a massive twist at the end. In a way I think that shaped my reading of the book, particularly the first half, and I was wondering if it was really going to live up to such high expectations. The story is almost completely centred around the three characters mentioned in the blurb. David is charismatic and Louise falls for him but she also falls under the spell of his beautiful wife, Adele. They should be the perfect couple but there are many problems beneath the surface and Louise finds herself drawn in and unsure who to trust and who to believe. I daren’t say any more about the plot! This is such a hard book to review because it’s so important not to give anything away. There are some fascinating threads to the story which I kind of want to search for on the internet just to see if they can really be possible but maybe I’m better off not knowing as it might just blow my mind! Whilst the first half of the book set the scene and introduced the characters and their relationships with each other, the second half really took off for me and I became thoroughly engrossed in the unique and clever story. As I headed towards #WTFthatending I was trying to think about what on earth was going to happen. It’s a testament to the writing that I didn’t guess until it was totally upon me and the thoughts in my head were basically of the ‘no no no’ variety. And then I was hit with another shock which left me with my mouth hanging open. This is an ingenious and dark psychological thriller with just the right level of believability to make it work. Sarah Pinborough is by no means new to writing but I think this book is going to propel her into another stratosphere. Thank you to the publishers and Netgalley for the review copy. 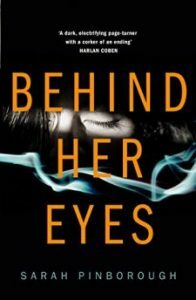 Behind Her Eyes was published on 26th January 2017 by Harper Collins. I seriously hope that some of those things can’t happen! Thanks, Lorraine. I kept re-reading it to make sure I hadn’t spoiled it for anyone. It’s certainly not what I expected. I can’t wait for you to read it either. I’m very intrigued by this one now, it sounds great. It’s been marketed very cleverly and the blurb doesn’t even nearly cover what it’s all about. Thank you for saying that, Cleo. I agree it deserves its hashtag.